We are pleased to announce that all items purchased on ZivicStudio.com are now FRAME INCLUDED. This includes all past items added to the site as well as all future items. 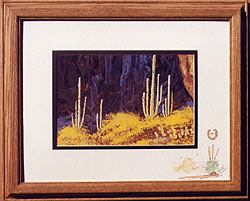 Below is a sample of a typical framed piece. In the past, we offered UNFRAMED items primarily to keep item cost as well as shipping costs to a minimum. But a number of our longtime collectors have asked about the possibility of selling framed pieces online. As such, we have adjusted our prices slightly and are now happy to offer the same "finished product" that we offered for over 40 years in our Gallery in Arizona.